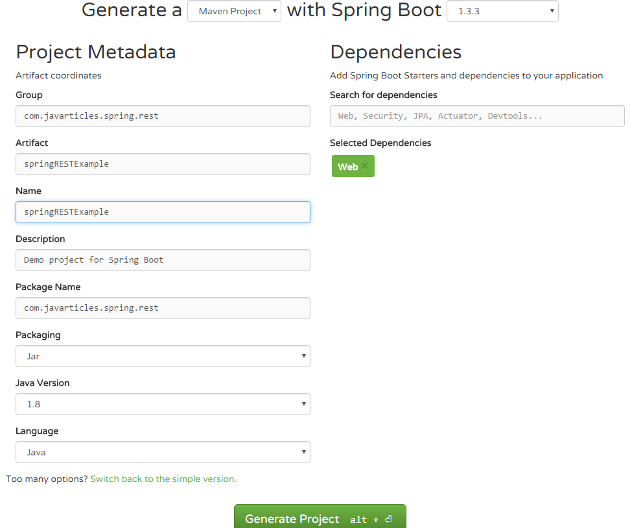 We will first build a Spring Boot project using Spring Boot’s starter website http://start.spring.io. Enter the group and artifact information. Add web as the dependency and then click on ‘Generate Project’. Unzip the source code and import in Eclipse as a Maven project. spring-boot-starter-parent – This is the parent POM. It will provide the useful Maven defaults. 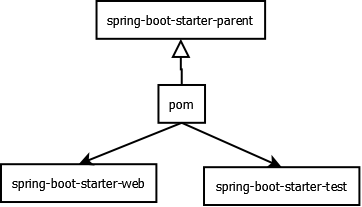 spring-boot-starter-web – Since we are developing a REST service, we will need spring web based dependencies. The web starter will also set up an embedded servlet container. spring-boot-starter-test – This will add spring-test module and test dependencies like JUnit, Hamcrest and Mockito. spring-boot-autoconfigure – Spring Boot figures out how to configure based on the jar dependencies that you have added. In this example, we will create a REST service and a REST client. Our REST service will return all the employee objects. @Controller – Indicates that an annotated class is a “Controller”. Class annotated with @Controller will be automatically registered as Spring Beans. It will look for RequestMapping annotation for mapping web requests onto specific handler classes and/or handler methods. @ResponseBody – If a @RequestMapping method is annotated with @ResponseBody, its return value will be bound to the web response body. If a method returns a POJO type object, spring will automatically convert it to a JSON style data format and append to the response. Method getEmployeeNames will be called as we enter http://localhost:8080/employees in the browser. We now write a simple REST client to call the above REST service. The spring boot application will start the server and the make a REST call to our new service and retrieve the employees. This was an example about Spring Boot REST services.